Connect offers advanced Wi-Fi reporting capabilities including 6 new Wi-Fi reports that give you greater visibility of data across your entire workspace portfolio. These reports give you the ability to make important data-driven business decisions across multiple sites based on Wi-Fi services consumption. Learn more here. We resolved an issue to service allocation within Connect. When adding Lounge Wifi the process hit a Hibernate error. The client filter drop down was fixed as it was displaying incorrect data. We resolved an issue where we were missing Monthly Site Reports within Connect. We resolved an issue which impacted device types and total wireless transfer data. We fixed an issue when loading the Single Client Billing page, there was a console error, and the itemised list did not render, however the files were still available for download. We have added ‘Last Active’ to switch manager. We show this on the switch manager front page itself - when a switchport is selected we display some information about the port in the footer, we include the last active time (if this exists). Also, in the Switch Port List → For Site page. This is a data table, we have added a new column between the Status and Role columns. If we do not have the data from the API response we include ‘Unknown’ as the value in this column. We now allow special Characters for the following fields: Company Name, Address, User First Name, User Last Name. Users can now Hide or Show the configuration of currently enabled User Features for their telephone so they can keep a tidy User Features page. When presenting User Features page and a feature is already enabled, the configuration will be hidden and the user needs to toggle OFF -> ON again to show the config. [IVR] Validation was working for telephone package only - it now extends for telephone only, phone only products. A case is now created in Connect to notify that a Client with a Bandwidth telephone number is porting their number away from your site. Also, Centre Managers now have the ability to log cases for Clients only, not for the Operator/Site. We have added a cookie notification to Connect. End-users who view the Service Guide, can now see the contact hours for essensys in local UK time. Connect users with an associated extension will have their extension removed if they have their user role changed. Resolved the caching issue causing a green screen on the example template after applying a new logo and saving. Connect allows different custom email templates per site within an Operator if desired. We have removed the email address from being part of the Operator name. Resolved an issue with the Billing section of Connect hanging after downloading a file. Fixed a broken Browse button in many areas of Connect when using Firefox/Edge. Fixed an issue with the Scheduled Date field on Decommissioning a Client appearing as not selectable. Connect now gives you the ability to brand the automated emails that your end users receive from Connect. This includes adding logos, setting your desired colour theme and using your own sending address. Resolved an issue that was causing the Client conversion from a Virtual Client to Residential Client, and vice versa, to fail requiring manual action from essensys. Resolved an issue causing brand new Support cases not to display in Connect until essensys have acknowledged. Added validation when removing a Public IP service on an active Client to check if they have any active switch ports with the role of Public IP. Fixed an issue with accented characters in a Clients name causing problems with automated provisioning. Fixed an issue with the Call Recording section of Telephone Manager not displaying all extensions currently recording. On the Wi-Fi Stats, Bandwidth Graphs and Enhanced Call Reporting sections of Connect, the default time selection is now Today. This was previously set to Week. Fixed the Click to Dial feature on the Connect mobile app. Fixed an issue with the Export Service Guide not displaying the Internet Access field correctly if on a custom shared pipe. Fixed an issue causing problems activating the Softphone App for a user if they were not logged into a handset. Extra functionality has been added to the Telephone Manager section under User Features where you can choose to block specific numbers from calling you. This is called Selective Call Rejection and is available on all telephone numbers at your site both for you and your end users. Simply toggle this feature ON, add any telephone numbers you wish to prevent from calling you and Save. This number will no longer be able to call you and will instead be presented with a Busy tone. Just as you have a login to Connect, your end-users also have access to Connect where they can view and control some of their own I.T. services. The Support section for your end users has been developed to provide support links and articles relevant to them. This links to an alternate version of this Knowledge Base, help.essensys.tech, which has articles specific to the end user experience with I.T. services and Connect. Fixed an issue that was preventing you from decommissioning a Client that was scheduled for activation and not yet active. 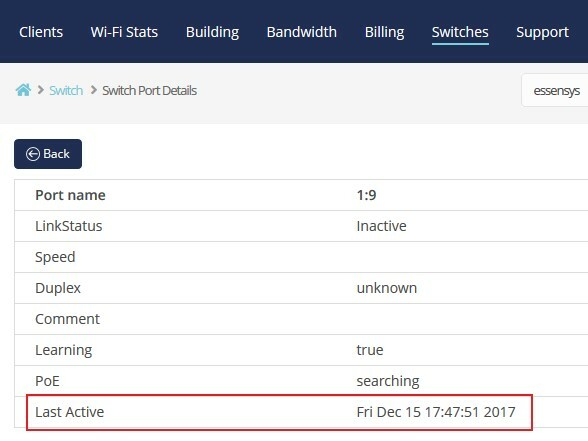 Fixed an issue on the Switches page that was causing the switch ports used for your Wireless Access Points and Uplink ports to simply display as grey and inactive although they were active. Connect records and displays all tasks that are completed using the portal at your site by all users. This is available on the homepage under the Tasks tab and selecting Show Completed Tasks. We have added additional information to any tasks on switches to now include the exact switch ports that were included in the task. We have also added a View Task button which will show further details on certain tasks and display in its own window. Some users were missing the Metric button from the Enhanced Call Reports section where you can display your total calls by Count or Duration. Improved the Bandwidth section when looking at graphs for one of your locations in a different time zone. Fixed an issue where the assigned offices were not displaying in the Edit Client screen. 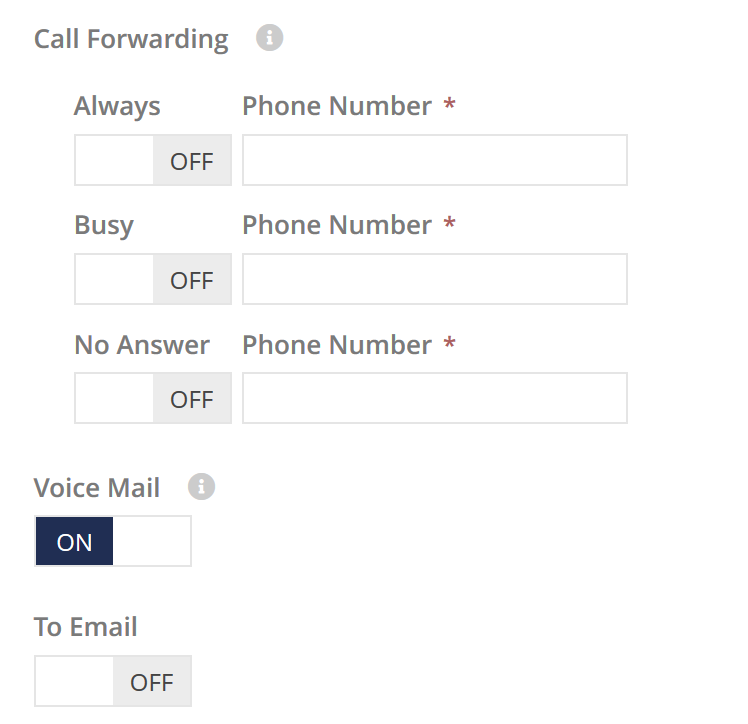 For each of your Clients, Connect will automatically reserve a Main Number which you can choose to activate if desired from the Telephone Manager section. This number has built in Hunt Group functionalities which can been controlled from the Main Number Setup page. One of these Hunt Groups is named In Office. When this hunt group is selected from the Main Number Setup page and the Main Number is called, all active extensions within the Client will ring simultaneously. We have now added further customisation of the In Office hunt group which allows you to choose which extensions do and do not ring when the Main Number is called. Each active extension on Connect can be assigned to a specific Connect user. When assigned to the user, they can login to their own Connect portal and directly control the features of this extension like call forwarding, and importantly they can use the Softphone. The Softphone allows the user to make and receive calls from their usual landline number directly from their computer or laptop anywhere in the world. We have added the ability to assign an extension to a specific Connect user at the same time of enabling the extension inside Telephone Manager. This will also populate the First and Last name fields of the extension. You can still control the users and their assigned extensions from the Users menu as normal. The Data Port List allows you to view all data ports on site, their corresponding switch ports and how they configured all from the same place under the Building section. We have made improvements here show which specific Client is assigned to each floor port to give you better visibility on how your offices and floor ports are functioning. Connect now allows you to disable & enable DHCP for your Clients. When you add an Internet service a Client, essensys Connect automatically builds what is essentially a managed network. This manages the internal IP addressing, security and routing. Some Clients would like to manage their own internal IP addressing through their own equipment and will need the essensys Connect provided DHCP disabled. To disable, or re-enable if previously disabled, visit the Network Info page for the Client. This can be found from highlighting the Client from the Clients page, click the More drop down menu and select Network Info. We have added a new, selectable option within the Users menu to activate the users Wi-Fi access at the same time of initially adding the user. If enabled, this will automatically enable their Wi-Fi access and email them their unique username and password to connect to the Wi-Fi Secure. Call Waiting is the telephone feature which allows you to receive a call while currently on the phone. If turned enabled and another call comes in while you are currently on the line, you will be prompted the other call is coming in. If turned off, any inbound calls while you are on the line will divert straight to your Voicemail if enabled, or present a busy tone if not. Fixed a web cache issue that was requiring users to log out and in before being able to make any changes. Fixed an issue where some floor ports patched to Wi-Fi switch ports were displaying as Role: empty. Inside the User Features of your telephone numbers, you can now pick and choose exactly when inbound calls forward onto another number. Always - All inbound calls will forward to your selected number immediately. Busy - Any inbound calls received while the phone is currently in use will forward to your selected number. No Answer - Inbound calls will first ring your telephone number. If unanswered after 3 rings, the call will be forwarded to your selected number. Within your pricebook on Connect (Clients -> Service drop down menu -> View Pricebook), you are able to view and export all available marketplace services that you can provide to your Clients. We have made minor improvements within this document to improve the formatting and style. Fixed an issue that would allow Connect users to amend a locked switch port through the New Client Wizard or Building Manager. Locked switch ports can only be locked and now amended by contacting essensys Support. The Client Breakdown of your Bandwidth graphs, where you can see the bandwidth usage of your Clients in your Shared bandwidth pipes, was not displaying data temporarily. Some offices assigned to your Clients were displaying as No Office. This has been resolved to show the correct office assigned. The greeting field for your customers Main Numbers were occasionally failing to push through to your EVO Call Answering software. This has been resolved so your Clients can enter the desired greeting of the phone through Connect Main Number Setup and this will display on EVO. We're excited to announce the launch of the Softphone App for iOS and Android devices. The Softphone App allows you to make and receive calls from anywhere over 3G, 4G and Wi-Fi at local rates all while using your existing landline number. For more information, please visit the Softphone Knowledge Base article. We have extended the searchable time for your Bandwidth usage graphs. On the 'Bandwidth' page on Connect, you can now use Custom date button to view 30 days worth of usage up to six months ago. The Switch Port Details feature within the 'Switches' page on Connect now displays the time the specific switch port was last active, alongside other useful information about the switch port. Last Active Time is the time the switch port last saw a device plugged in and turned on. This helps determine if a switch port is actually being used or not. We have improved and expanded the Enhanced Call Reports to give you more granular and useful data. The Enhanced Call Reports now display a breakdown of internal and external calls so you can identify which calls are made internally and externally. 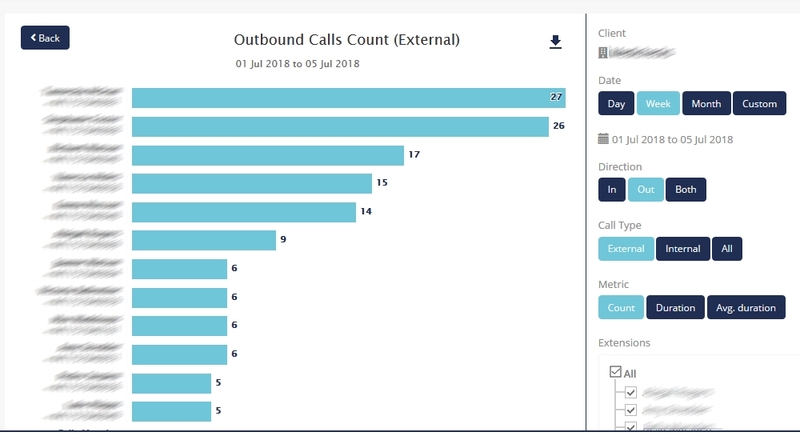 The page now allows you to filter the calls displayed by call type, inbound/outbound/both giving you a more detailed and granular insight into the calls made. The Enhanced Call Reports page now remembers your selected filters and extensions so you if leave this section and return, you won’t have to set them again. This will reset if you leave Connect entirely.